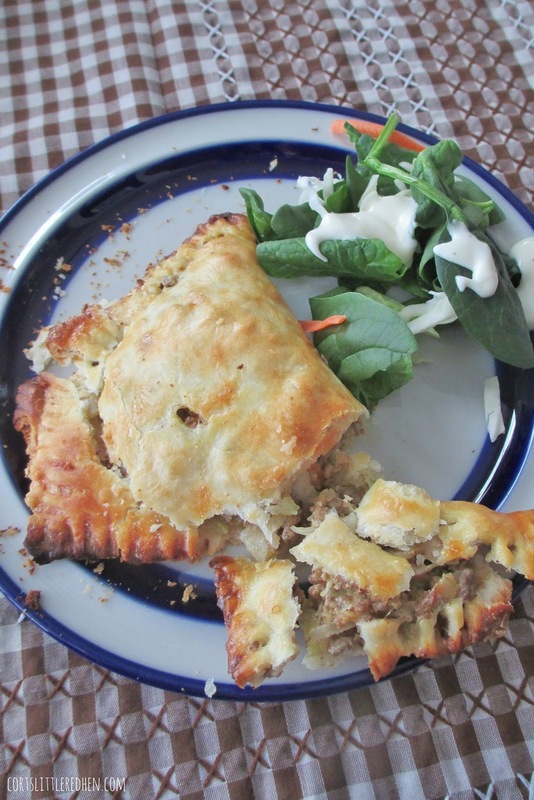 Delicious, flaky and meaty, these pies are a sure family favorite! 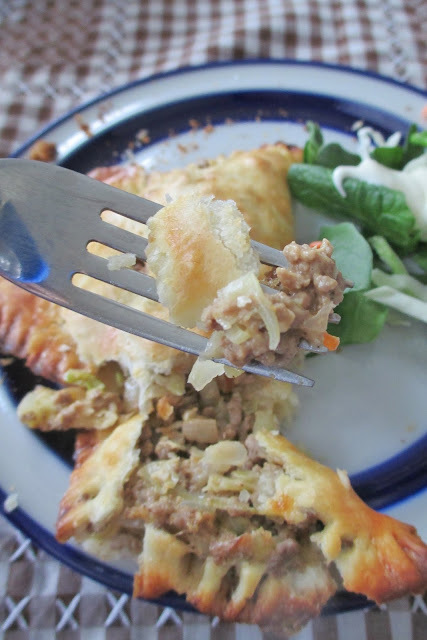 It kind of feels like the wrong time of year to make these Pennsylvania Dutch Pies, but it is rainy and cloudy again here, so I think it is still a good idea to eat them. Plus, they taste really, really good. Is there ever a bad time to eat something that is really, really good? I can't think of one. At first I thought, "A funeral is a bad time to be eating really, really good food," but then I remembered you always have a good luncheon and talk about happy memories at funerals, so that's out. Then I thought maybe standing in line at the DMV would be another inappropriate time, but then that is such a miserable experience that really, really good food could only improve the situation. Perhaps during the second act of an opera would be a bad time, (although I do have a story which involves a symphony, my little brother, a large leather jacket, and the smell of chicken fingers wafting through the air, but that story is for another day.) Of course, the bathroom is the obvious bad place to eat really, really good food. But let's not go there...figuratively. These Pennsylvania Dutch Pies are easy, delicious, and an easy freezer meal. Ground beef, cheese, and cabbage may sound kind of boring, but the dijon mustard makes them taste awesome. The first time I had these Dutch Pies was my birthday a few years ago. I thought we would go out to dinner, but our night was running late and my best buddy, Alicia, had gotten my husband and I tickets for Peter Breinholt's Christmas concert. There was a huge snowstorm, so we crawled downtown, parked, and got to the concert in plenty to time to sit, but not in enough time to eat dinner. The concert was amazing- I got to be with some of my favorite people and listen to my favorite music in a beautiful place- but by the time we got home it was WAY late. I'll admit, I was a little grumpy that my birthday dinner was a lame ol' freezer meal until I took a bite. Happy birthday to me! Pennsylvania Dutch Pies are tasty! And now you can make them too, even if it isn't your birthday. In a large skillet, cook ground beef, onion, and garlic until juices run clear and beef is thoroughly cooked. Drain grease, if desired. Add cabbage and cook until wilted, about 5-10 minutes. Remove from heat and add mustard and cheese. Add salt and pepper to taste. Set aside to cool slightly. On a floured surface, roll out pie crust. Cut into 4 pieces. 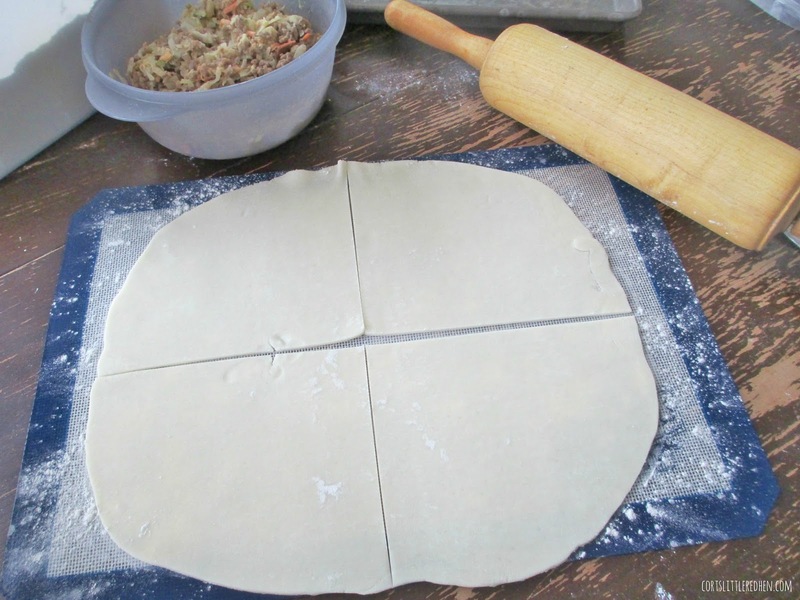 Lightly fold each piece of crust in half, so there is a gently crease. 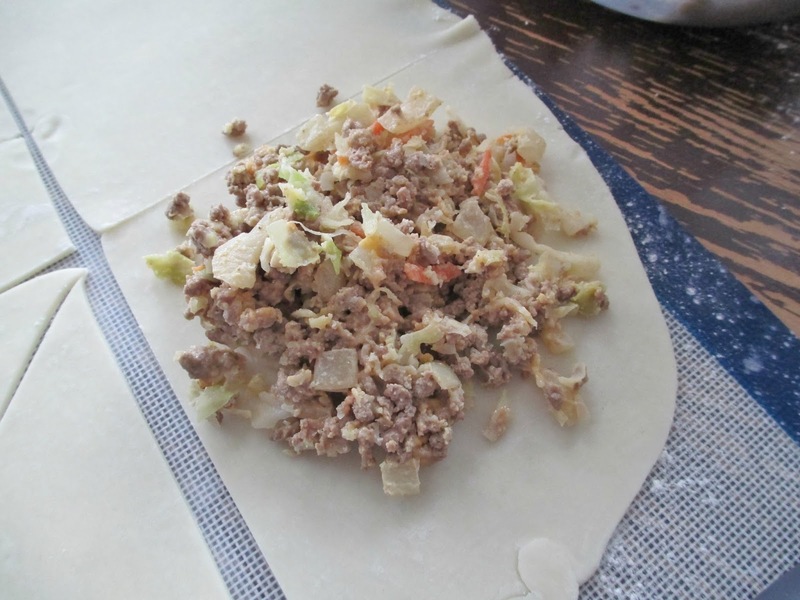 Put about 1/2 cup beef onto each piece of pie crust. Fold in half and use a fork to seal the halves together. Repeat until all filling is used. ** Refrigerate pies for 30 minutes. Preheat oven according to pie crust instructions, or 450 degrees. Place pies onto prepared cookie sheet. ***Mix egg white with 1 tsp water. Whisk with a fork and spread onto each pie. Bake for 10-15 minutes, or until pies are golden brown. Serve immediately. 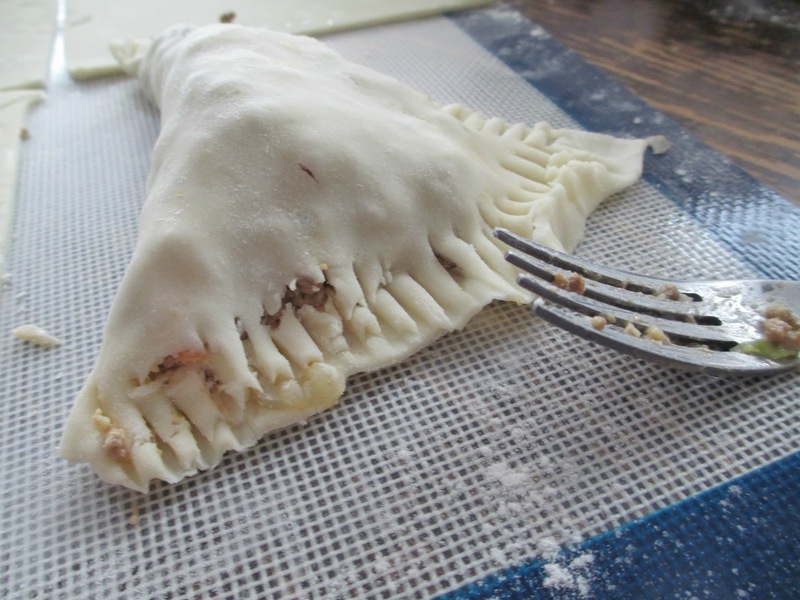 ***To prepare pies as a freezer meal, once pie crusts are filled, wrap individual pies in freezer paper and seal in Ziploc bags. Do not do egg white wash until ready to bake. To bake, unwrap frozen pies, brush pies with egg wash, and bake at 450 degrees for 15-20 minutes, until pies are cooked through and golden brown.